In preparation for the release of a new season of "Bridezillas" the TV show, one of our realistic dinosaur performers was invited to the launch party in Times Square in New York City! The event organizer dressed our poor dinosaur in a white veil and even had him hold a bouquet of flowers between his claws. Our dinosaur got to meet the Naked Cowboy and a few Bachelorettes from previous seasons of the hit reality TV shows The Bachelor and The Bachelorette. In addition to our realistic dinosaur performer, we had the opportunity to provide the Bridezilla Museum of Natural Hysteria in Times Square with an animatronic dinosaur statue that was also dressed up as a bride. The dinosaur could be seen at the temporary museum in Times Square, New York City from February 20, 2018 to March 4, 2018. See a photo below of our animatronic dinosaur with a few former Bachelorettes. The event was reported on by various news sources including the Times Square Chronicles and The Daily Brief. It is not often that one can see a performer in a realistic dinosaur costume in New York City. Our "Bridezilla" took a quick lap through Times Square on the way to the party and caught lots of looks and took lots of selfies. Our realistic dinosaur performers had an amazing time at the party and have been invited back for an appearance on Good Day New York this Friday March 2, 2018. Look for us on TV! Hire a Realistic Dinosaur Performer in Oregon and Washington. Phil the T-Rex is on the loose! As you can see, Captain America is no match for Phil. He nearly lost his head! Luckily, Phil the T-Rex is well trained and is well-behaved... as long as he is well-fed. Until now, dinosaur fans in Portland, Seattle, and other cities in the Pacific Northwest have not had a chance to see a realistic dinosaur costume in action. Phil and his trainer will be criss-crossing Oregon and Washington in the coming months to allow Phil to meet Jurassic Park and Jurassic World fans! Phil's Jurassic Park Jeep is a 95 Jeep YJ that is identical to those from the original movies. Contact us at the button below to get more info (including pricing and availability) on hosting Phil and his trainer's Jurassic Park Jeep at your next event! Check out Phil's profile and the rest of our dinosaurs on the Meet our Dinosaurs page. Click the button above to hire a realistic dinosaur performer in Oregon and Washington! New Bumblebee Transformer Performer in the U.S. Although we specialize in realistic dinosaur performers, Dinosaur Events is proud to welcome our new resident robot, a transformer performer named Bumblebee. Luckily, he seems to have made great friends with the dinosaurs. We'll be taking some more action photos and creating a video soon, but see some staging photos of our Bumblebee costume below and feel free to contact us to hire a bumblebee performer for your event! Pretty impressive Transformer, right? At 8.5 ft. tall, Bumblebee is a gentle giant. He loves putting on a show at corporate events, kids parties, and car shows alike. He speaks, he walks, he moves, and he dances. Of course, his only move is "the robot." 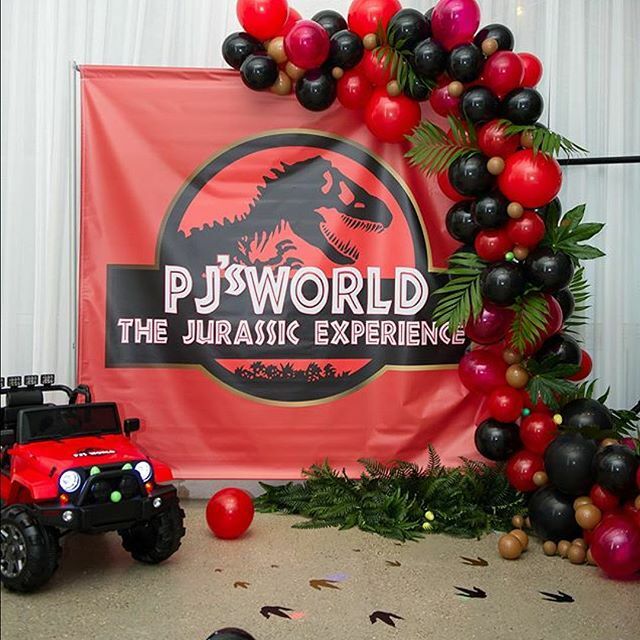 This past weekend, one of our T-Rex performers had the opportunity to perform at a Jurassic World themed birthday party in Chicago, Illinois. We had a blast! Our dinosaur made a grand entrance through Jurassic Park gates with the birthday boy on the dinosaur's back. It was crazy! We spent the next few hours taking pictures, getting to know the guests, and chasing some of the kids around the venue. Considering our dinosaurs are all about 12-13 feet long, we are always sure to send a dinosaur handler along to make sure the tail doesn't knock anything over. This dinosaur birthday party was decorated beautifully and we didn't want our T-Rex performer to break anything! 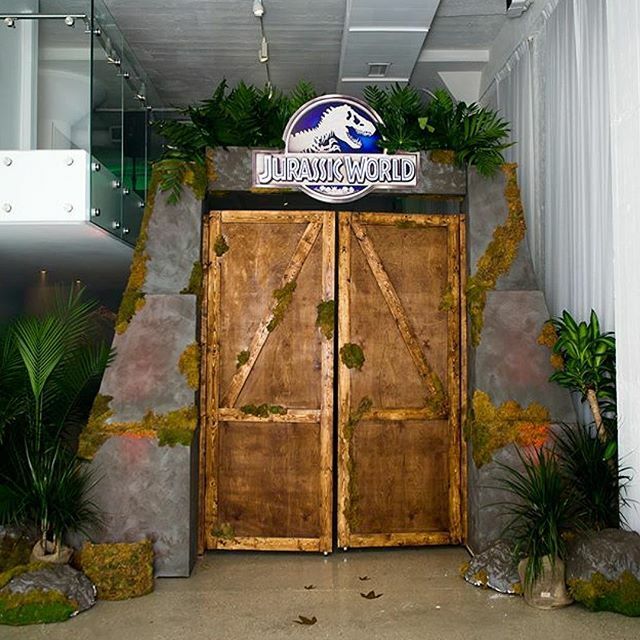 Downtown Chicago is a beautiful place, so we are grateful to Nicole Marie Events for organizing the Jurassic World party and the family for inviting us to their intimate, dinosaur themed party. Good times! Here are couple of pictures from the event. We perform for a lot of corporate events and parties, but we absolutely love when we get approached by television shows, commericals, and movies to feature our life-like dinosaurs & costumes. If you need us for a dinosaur prank video, office prank, commercial, or television show, Arnie is always glad to lend a hand (or any of our dinosaur fleet). 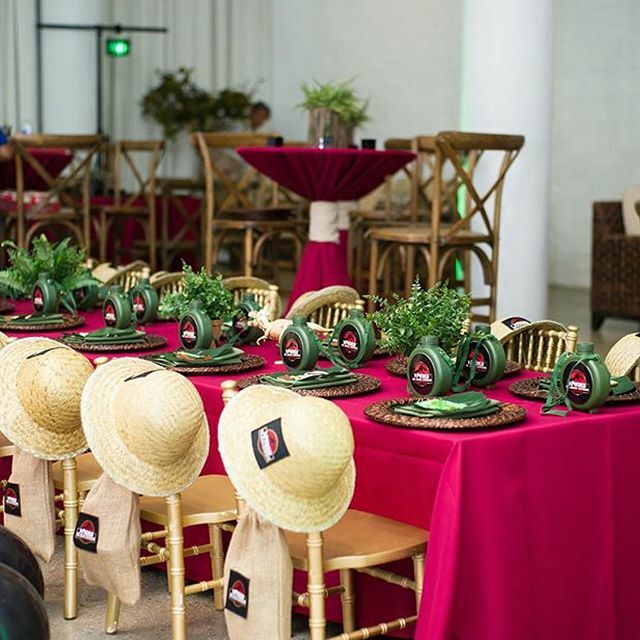 Contact Us at Dinosaur Events and let us help you out. We also have 2 baby dinos (hand-help puppets), an inflatable comedic costume. Depending on the time of year, Dinosaur Events also may have 2 or 3 extra dinosaurs in our fleet so if you need a 6 or 7 dinos for a jurassic park event, we've got you covered! Dinosaurs - As Seen on Comedy Central! We had a blast being apart of the episode and it was really interesting to see how much work goes into filming a single episode. Because we had to shoot while the museum was closed, we had to shoot until the wee hours of the morning. Needless to say, we were pretty exhausted by the end, but it was still a blast. Now I'm sure everyone will be lining up to get the autographs of the Workaholics dinosaurs... after all, we're celebrities now :P . If you watch the episode, you'll see that we did not, in fact, get to play ourselves when outside of the dinosaurs. Mike was played a woman much shorter than him. Contact Us & inquire about Hiring a Dinosaur performer for your own event, TV show, or office prank. P.S. we were recently contracted to do another TV show so stay tuned for more information on that. Our two Dino - studs got to strut their stuff and show off for a few days at the MegaPlex Jurassic World Premiere. Scaring people as they came out of the theater was particularly fun for our dynamic duo. There is nothing quite like seeing the Aw ... (and terror) of little kids as they interact with our adolescent T-Rex's . These realistic dinosaur performers are a blast!